SATURDAY, FEBRUARY 16, 11:00-4:00 P.M. 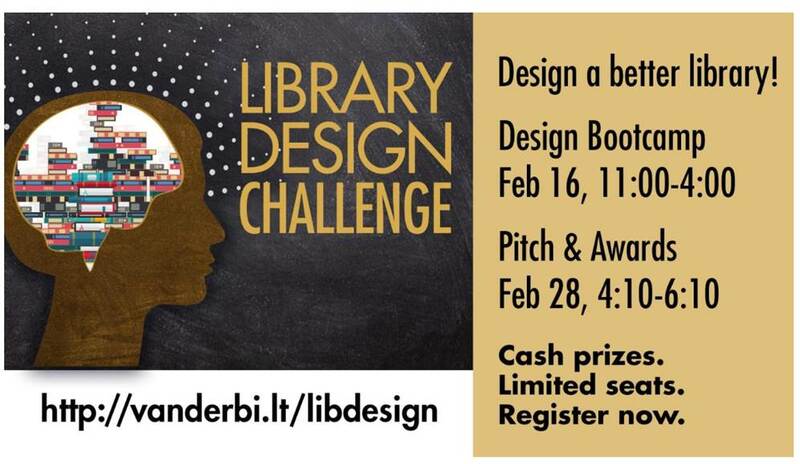 The Library Design Challenge is open to all Vanderbilt students interested in learning about design thinking and applying those principles to make the library’s collections, facilities, and/or programs & services more accessible and meaningful for users. The event will consist of a design thinking bootcamp to be held at Peabody Library on Saturday, February 16th, and a pitch event and awards ceremony held in the Central Library Community Room on Thursday, February 28th. Students must RSVP via AnchorLink to participate.